This was by far one of the most well-run races (it is NYRR after all), through NYC with beautiful views of the World Trade Center, Central park and through times square. The Expo was incredibly cool being that the race was sponsored by United Airlines. When you entered the venue it was like you were entering an airport. It was very creative and I was a major fan. Come race morning, it was a tad bit chilly, much colder than I was expecting. For those of you who have never run this race, be aware that when they say get there 45 minutes early, do it! Because getting through security, is fun and a wait. Mom and I were in separate waves, but I went back to start with her because otherwise it would have been a 20 minute wait. Starting in a slower wave however made running through Central park difficult because I was constantly running around people. Central Park really only had one difficult hill in the direction we were running and then after that it was rollers. When exiting Central Park you popped out into 7th Avenue and immediately starting to run into Times Square. That was when the wind hit. 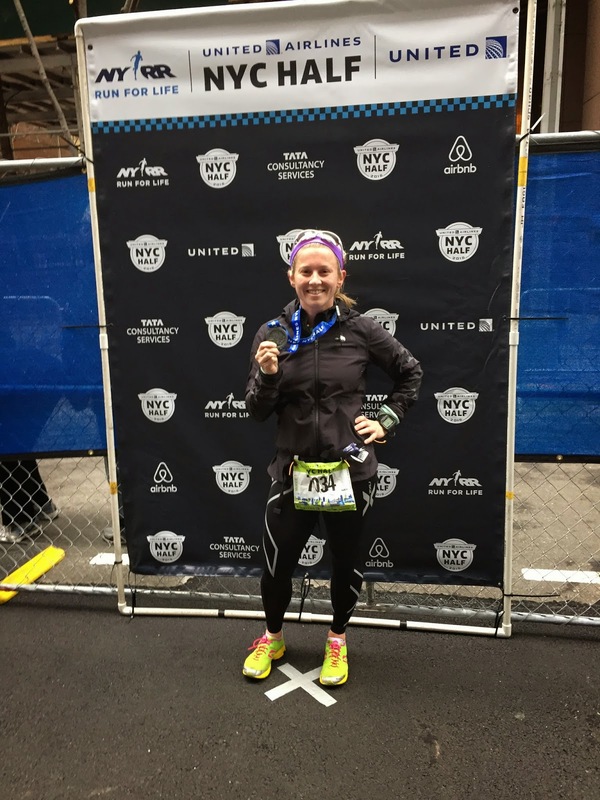 It was very windy that day and you can definitely feel it when you are running through the wind tunnels that make up NYC. After hitting the west side highway, it was just fun shots of downtown NYC, the Hudson, NJ and, of course, more wind. While running this race, I downloaded the Motigo app and ran with it during this race. It was incredibly cool because I was able to listen to friends and family leave me messages that would be played at specific mile markers. I received a bunch during the race that played on the west side highway and if there was any point where it was welcomed, it was there. The race finished in the battery by wall street. If there was one thing I did not like was the point to point race because trying to find a way back to the hotel and specifically a cab with 20,000 other runners trying to get home. That was challenging and waiting for mom to finish was cold because the temperatures got colder and the wind picked up. Overall, I loved this race and would do it again, even though it was a point to point. Perks: running through NYC, the expo, the medal, organization.